Categories: All Parts, Mobility Scooter Parts, Shoprider Cameo. 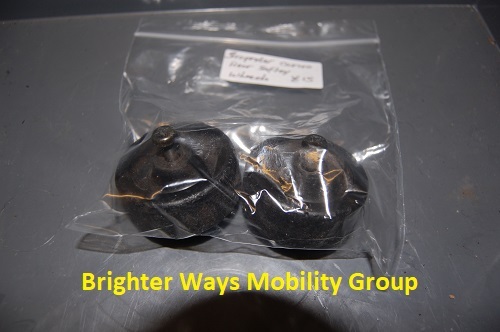 Shoprider Cameo – Pair of Rear Safety Wheels in good working condition, item is second hand in a ok condition signs of use. Kymco Mini LS - Empty Battery Box in good working condition, item is second hand in a good clean condition. All our parts are second hand and are fully tested before they are dispatched from our warehouse, all parts are priced to sell and are all security tagged. The pictures are of the exact item Please make sure you order the correct part. Strider Micro 4 - Charger Plug in Point in good working condition, item is second hand in a good clean condition. All our parts are second hand and are fully tested before they are dispatched from our warehouse, all parts are priced to sell and are all security tagged. The pictures are of the exact item Please make sure you order the correct part. Shoprider TE888AN - Full Set of Rear Lights in good working condition, item is second hand in a ok condition signs of use. All our parts are second hand and are fully tested before they are dispatched from our warehouse, all parts are priced to sell and are all security tagged. The pictures are of the exact item Please make sure you order the correct part. Pride GoGo Elite Traveller Plus - Basket in good working condition, item is second hand in a ok condition signs of use. All our parts are second hand and are fully tested before they are dispatched from our warehouse, all parts are priced to sell and are all security tagged. The pictures are of the exact item Please make sure you order the correct part.